Blepharitis is a common eye condition affecting over 30% of all patients and can cause significant ocular irritation symptoms. 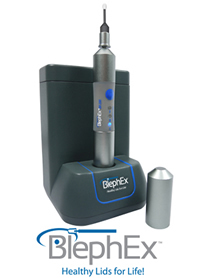 BlephEx™ is a new, in-office procedure that allows our Optometrists to take an active role in treating your blepharitis. This treatment removes the crusty deposits and bacterial debris on the eye lids eliminating the main cause of inflammatory lid disease.